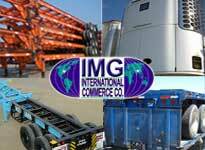 IMGInternational Commerce Co, sells Used 40 Foot Container Chassis with 8 pins. When chassis has a gooseneck frame, it carries one 40 ft Tunnel or High Cube type ISO container or two 20ft ISO (24,000 lb each) or One 20 ft ISO container weighing (33,750 lb) in the flush back position. Meets all DOT, TOFC, AAR, FMVSS, ANSI, SAE and TTMA specifications. We sell and export Used 40 Foot Container Chassis with 8 pins in “as is” condition or in “remanufactured” condition. Length 40 ft 6“, width 96 inches. Two axles, king pin location 30 ½” from front of chassis. Spring suspension, high and heavy duty I-beams, chassis weights aprox 10,300 lbs. Chassis are usually sold in bundles of 3-4 chassis. When chassis has a straight frame, it carries one 40 ft Standard type ISO container or two 20ft ISO (24,000 lb each) or One 20 ft ISO container weighing (33,750 lb) in the flush back position. Meets all DOT, TOFC, AAR, FMVSS, ANSI, SAE and TTMA specifications. Length 40 ft 6“, width 96 inches. Two axles, king pin location 301/2’ from front of chassis. Spring suspension, high and heavy duty I-beams, chassis weights aprox from 8,500 lbs to 10,000 lbs depending on model and manufacturer. Chassis are usually sold in bundles of 3-4 chassis.